Winter in Central Texas is the best time to plant and transplant roses. Roses are one of my absolute favorite plants and I think they have a very bad rap for being high maintenance. While that may be true for some of them, there are now many hybrid varieties of roses that do very well with little maintenance (low water disease resistant) and are more prolific bloomers than ever. When planting a rose you need to be sure to have a well prepared bed in good sunlight. 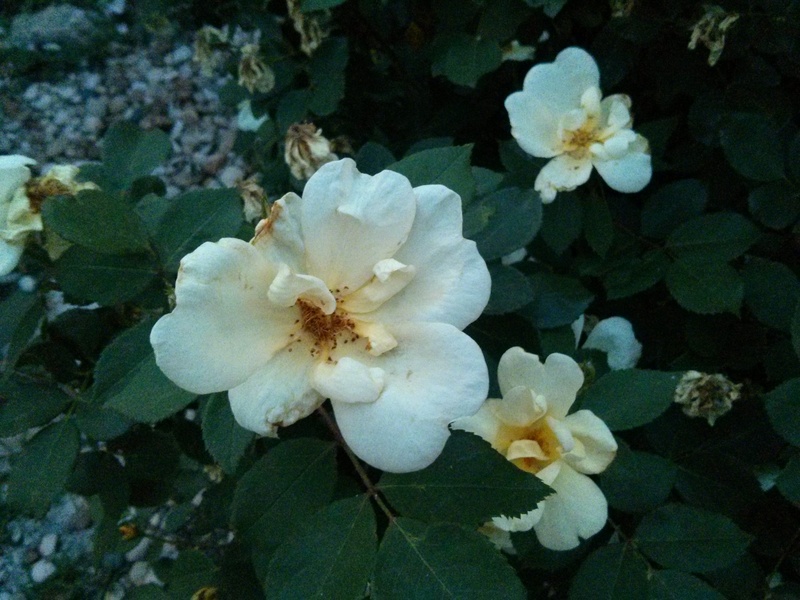 The “Natural Gardener” in Oak Hill has an amazing rose soil, and you will surely have great results with it. If this isn’t convenient for you, make sure you use a quality garden soil in a well-drained site and be sure to plant the rose with the graft union (knobby thing at the bottom) sticking about two inches out of the soil. If the rose is in a planters bucket, it should already be in the right place, but be sure not to bury the rose too deep as to cover it again. Make sure you plant your roses far enough apart from other plants to give them plenty of space once mature. Roses like a lot of circulating air and providing them with plenty of space will help reduce the chance of fungus. Make sure your irrigation is not watering the leaves as this also contributes to fungus and black spot, soaker hoses are best for roses. If your roses do get black spot, remove the affected leaves from the plant, bag them and dispose of them in the garbage can, throwing them on the ground or in your compost spreads the disease. This is a shot of Aphids being munched on by Lady Bug Larvae ( thanks to David Cullen) This is why it is soooo important to avoid chemicals and know who your allies are! Blaze Climbing Rose, the gift that keeps on giving all year-long. February is the time for trimming your Roses in Central Texas. Hybrid tea (long stem rose that produces only a few roses at a time, only a few times a year), grandiflora (shrub rose 3’x5′ with long stems that produce a cluster of flowers and bloom most of the growing season) , and floribunda (shrub rose 2×3 that produce groups of flowers in clusters along stem, also bloom all season) can be cut back to about 1-2 ft. Be sure to cut all of the dead wood away from the rose plant. 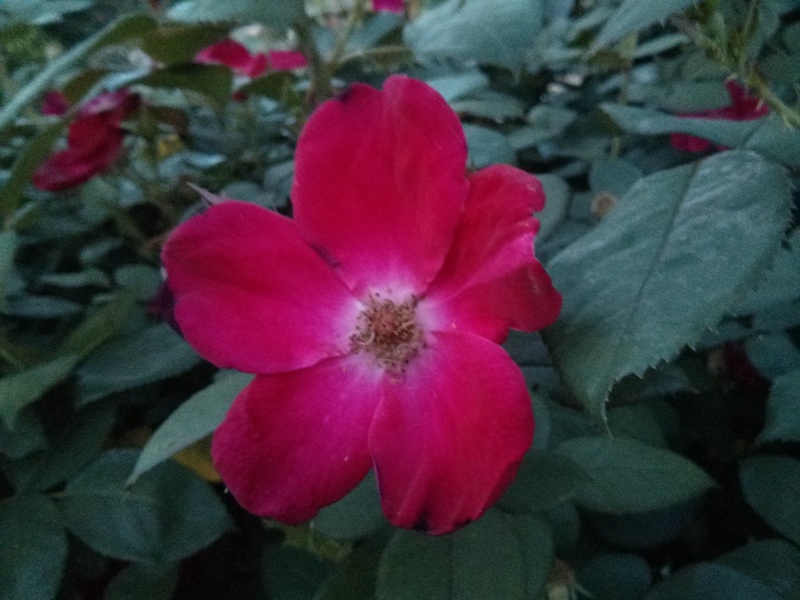 If you have climbing roses (roses that can grow to 20′ in length and produce several long branches reaches varying heights before blooming with clusters of flowers at the end of and along the stem), you really only need to trim them as you deem necessary, it is not suggested that you cut climbers too low (never less than 4′ from the ground), sometimes they don’t recover and can die completely. Be sure to use good sharp tools, I prefer a bypass hand lopper, but whatever you are comfortable with works too. Make sure you wear good gloves and long sleeves for protection, rose gloves are even better. Rose thorns really irritate the skin, not to mention they hurt like heck! Fertilizing can start around the end of February and you may already be seeing some buds at that time. I suggest you always use organics and my favorites are liquid compost, liquid seaweed, or a molasses based fertilizer. These can all be found at a big box store or your local nursery, to apply just follow the instructions. I like to use my hose attached fertilizer sprayer and I will the fill the container with the liquid fertilizer and spray the leaves and ground with the fertilizer until the water runs clear. 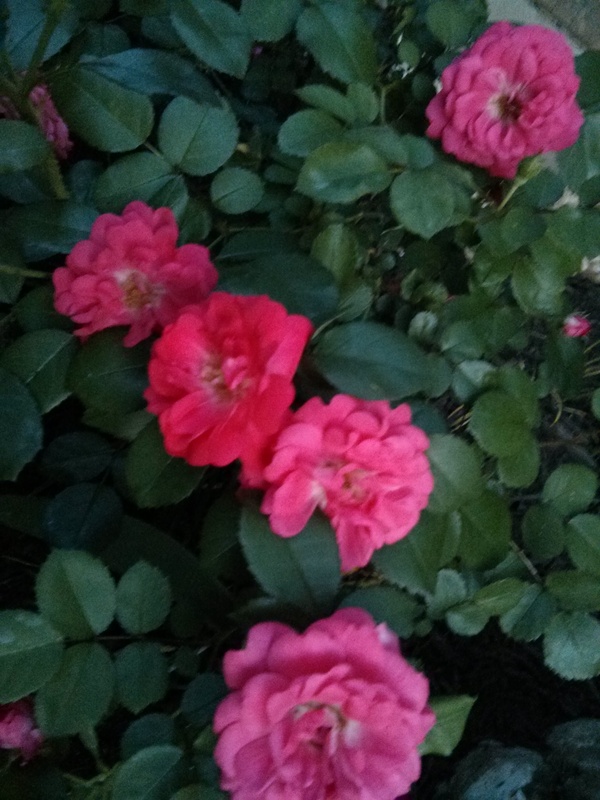 I also compost my roses by adding organic compost to the ground around the rose being sure not to cover the graft union at the bottom of the rose bush. Also, for all of you banana eaters, save your peels and bury them around your roses, it increases the rose size and production. As a stem supports the Rose, the thorns protect the stem. Thank you my beautiful husband for always supporting, protecting and encouraging me to blossom.